Disturbed Digest publishes original dark fantasy and horror short stories, poems, art, articles, reviews, and interviews. Preferred are fantasy adventure stories and spooky horror stories. For us, this includes paranormal and vampire pieces. Also preferred are stories that take place on other worlds. Stories must have the following: characters the reader cares what happens to, plots and subplots, and settings that draw the reader into them. Must have. FFantasy Fantasy Subgenres: Dark Fantasy, Paranormal, Supernatural, Vampire. HHorror Horror Open to all/most Subgenres, including: Dark Fantasy, Paranormal, Supernatural, Vampire. SShort Story Short Story 1,000 - 1,200 words. 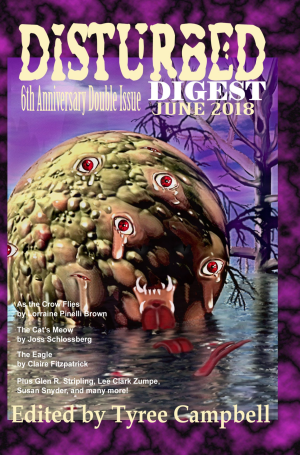 Disturbed Digest considers articles, which includes reviews and interviews as well as essays having something to do with fantasy, horror, paranormal, or vampire. IInterview Interview 1,500 - 8,000 words. VReview Review 1,500 - 8,000 words. RArticle Article 1,500 - 8,000 words. YEssay Essay 1,500 - 8,000 words. Open to all/most Forms. Excluding: Haiku (or related). PPoem Poem 12 - 100 lines. TToken payment (under US$5 per poem) Token payment (under US$5 per poem). We prefer art that suggests a story, rather than “portrait” art.